A recently published article in PLOS ONE describes a soil bacteria’s response to physical change in its surroundings. 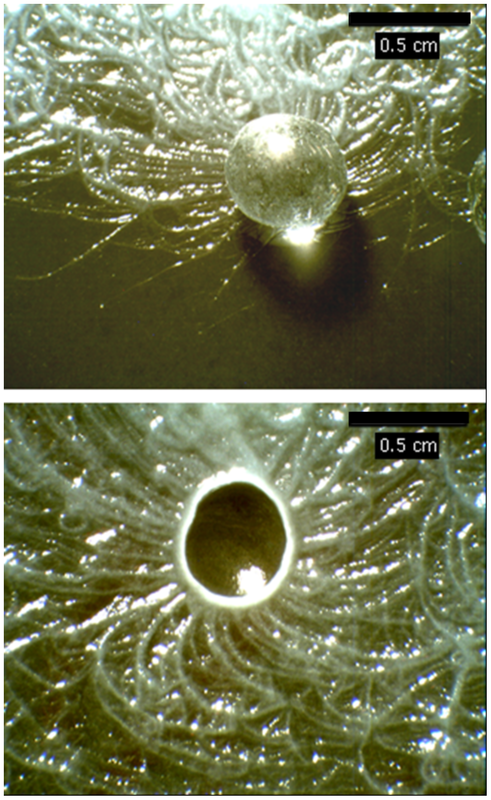 The bactieria, Bacillus mycoides, reorganized themselves into growth patterned around physical obstructions in their environment. Beyond the, “ooo, neat!” factor, this new knowledge of the bacteria may be useful for scientists studying tumor growth or engineers assessing structural damage. One week ago, people all over the planet celebrated World Soil Day. Organizations like the United Nations’ Food and Agriculture Organization, the United States Department of Agriculture, and the International Union of Soil Sciences all observed the holiday (links go to pages about World Soil Day). Soil even got a mention on Huffington Post on Dec. 6 in this blog post, 5 signs of healthy soil. Worried parents were wondering about their park’s soil after they saw a city worker mowing in a protective suit and mask. Ash containing heavy metals was spread on the park’s ground decades before it was a park and now there is some uncertainty about lingering risk. Miami’s Health Department says there isn’t a risk, but parents aren’t convinced by the department’s calculations, which were for 99-pound children. A medical toxicologist brought in to discuss the issue said, though the odds of the children becoming sick are low, there isn’t enough research to make a conclusive statement. So, the city probably going to remove the soil next year. The Miami Herald has the whole story. This entry was posted in Community, Environment, Science, Soil and tagged Bacillus mycoides, Contaminated soil, Contamination, Fukushima, Miami, Microorganism, PLOS ONE, Soil, Soil Science, World Soil Day by emilytoner. Bookmark the permalink.